I guess "slow and steady wins the race" with Oscar, though, since they chose to take the path of least resistance. It looked like a wimpy move 16 years ago and I don't think time will alter that opinion, since Pulp doesn't look to become any less scintillating any time soon. "The Bonnie Situation" helps recapture the magic of the initial segment, though it also isn't quite up to the highs of "Vega". To be frank, though, I'm nitpicking, because what's mediocre in Pulp would be outstanding in another film. This is moviemaking of the highest order, a thoroughly invigorating and exciting work that remains compelling even at its worst. A lot of this is due to the fine acting we see. John Travolta resurrected his career through his part as Vega, and he couldn't have done so in finer style. He plays the part with style and aplomb. Samuel L. Jackson's his usual outstanding self; that neither he nor Travolta won the Oscars for which they were nominated remains a crime. Some controversy accompanied the fact that Travolta got a Best Actor nod while Jackson only was considered for Best Supporting Actor. Really, the film contains no lead characters, so Travolta should have been in the supporting area as well, but he does seem to have the character with the most screen time. Vega's also the only one of the "main characters” who appears in all three vignettes; he plays a major part in “Wife” and “Bonnie” and makes a brief appearance in “Watch”. (One secondhand personal note: my friend Kevin's a flight attendant and he once had Amanda Plummer - who plays Honey Bunny - on a trip. He delights in telling how pushy and obnoxious she was and likes to call her "Demanda Plummer." I won't call Pulp Fiction the best movie of the Nineties - I'd still pick Se7en for that honor - but it's way up there. It's a film that belongs in everyone's collection. Pulp Fiction appears in its original theatrical aspect ratio of 2.35:1 on this Blu-ray Disc. Though usually attractive, some problems cropped up here. For the most part, sharpness seemed solid. Some wide shots displayed minor softness, but those instances occurred with reasonable infrequency. For the most part, the movie looked fairly crisp and well defined. Jagged edges and moiré effects created no concerns, but mild edge haloes showed up throughout the movie. These weren’t heavy, but they occurred on a fairly consistent basic. No issues with source flaws appeared in this clean transfer, but I suspect a moderate amount of digital noise reduction was applied to the film. Either there was never any grain in the image – which seems unlikely – or the picture got scrubbed of grain. This became most noticeable during interiors; those were the mushiest scenes and the ones that showed the most surprising lack of grain. Colors looked positive. Pulp showed natural and vivid hues that displayed no problems even in the toughest situations. For example, the initial shot of Butch in the bar bathed him in red light, but those elements stayed tight and distinct. Black levels also came across as deep and dark, while shadow detail was appropriately heavy without any excessive opacity. 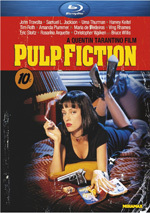 Most of Pulp Fiction looked strong, but the smattering of mild issues caused me to drop my grade to a still-solid “B”. The film’s DTS-HD MA 5.1 soundtrack showed a pretty restricted soundfield. Music demonstrated positive stereo imaging, and various environmental effects also blended together nicely. The track came to life reasonably well during some of the more active sequences, but general ambience dominated it. The mix didn’t do much with the surrounds, though, as the track usually boasted atmospheric material in the back channels. Nonetheless, I couldn't really quibble with the activity level of the mix; while it could have used a little more life, this is such a dialogue-intensive picture that I understand Tarantino's desire to keep the focus firmly up front. In regard to audio quality, Pulp sounded quite good with one exception: dialogue. Largely due to not-so-hot recording on the set, lines occasionally seemed thin and brittle. They were always intelligible, though, and they usually seemed fine. Music worked well, as the track displayed solid highs and deep bass. A bit of distortion could be heard during some songs, but those problems appeared inherent to the original recordings; the issue only occurred during the oldest songs. Gunfire also could seem slightly distorted, but not badly, and effects generally appeared relatively realistic and packed a good bass punch. This was a “B” soundtrack. How did this Blu-Ray compare with those of the Collector’s Edition DVD from 2002? The audio seemed a bit smoother and more robust, while the picture was crisper and better defined. The edge haloes and other concerns meant this wasn’t a slam-dunk Blu-ray, but it did provide obvious upgrades over the DVD. The Enhanced Trivia Track provides a good text commentary to accompany the movie. It covers a wide variety of topics. We get notes about film techniques that appear during Pulp, changes made from the original script, Tarantino’s influences and the way he connects characters and situations among his flicks, information about the actors, and quite a lot of other details. Occasionally, somewhat long gaps appear in the track, but usually the comments fly at a fairly rapid pace. It definitely offers a lot of useful information about Pulp. Soundtrack Chapters lists 13 of the different songs heard in the movie and allows you to jump directly to them. This does nothing for me, but it doesn’t hurt to have it. Next we find a documentary called Pulp Fiction: The Facts. The 30-minute, 31-second program combines shots from the movie, photos and other media, and interviews. We hear from Tarantino, filmmaker/Tarantino friend Scott Spiegel, effects technician Greg Nicotero, producer Lawrence Bender, editor Sally Menke, and actors Samuel L. Jackson, Tim Roth, John Travolta, Eric Stoltz, Rosanna Arquette, Bruce Willis, Ving Rhames, Amanda Plummer and Uma Thurman. Except for some of Thurman’s material, all of the actor interviews come from the set of Pulp, while the rest emanate from that source as well as other years. Two new programs follow. Not the Usual Mindless Boring Getting to Know You Chit Chat runs 43 minutes, one second and offers notes from Travolta, Jackson, Roth, Plummer, Stoltz, and Arquette. We hear how the actors came onto the project and their work with Tarantino, thoughts about the script, rehearsals and aspects of the shoot, characters and performances, reactions to the movie and its legacy. All the interviews come from modern sources, not like the other shows, and that’s a good point of view to experience. “Chat” digs into the actors’ perspectives in a full and involving way that makes this a strong program. It throws out a little fluff when the actors blow smoke toward Tarantino, but they deliver more than enough quality info to make this one worthwhile. We get a critical appraisal in the 20-minute, 37-second Here Are Some Facts on the Fiction. It features Elvis Mitchell, Scott Foundas, Stephanie Zacharek, Tim Lucas, and Andy Klein. They discuss their initial screenings of Pulp and immediate reactions to it as well as interpretation of the film and its techniques. We get a decent array of insights here, though I find Zacherek’s most interesting just because she doesn’t much like the movie; it’s intriguing to get a dissenting opinion. Next we get five deleted scenes. All except the final one come with introductions from Tarantino; the whole package lasts 24 minutes and 39 seconds. These segments are all essentially longer versions of existing scenes and are definitely interesting; Tarantino probably should have kept some of them. Don’t expect the snippets to look very good, though; they’re the same non-anamorphic widescreen pieces found on the DVD. After this we discover a Production Design Featurette that lasts six minutes and 22 seconds. We hear from production designer David Wasco and set decorator Sandy Reynolds-Wasco and also see many stills and sketches that relate to the material. They discuss their influences and what they wanted to do with the locations in this short but informative program. An excerpt from Siskel and Ebert At the Movies, The Tarantino Generation lasts 16 minutes as the critics talk about the aftermath caused by Pulp. They reflect upon their reactions to the flick and go over other attitudes toward it. We also see a segment in which Samuel L. Jackson responds to criticisms of the flick during an interview with Siskel. Overall, this piece offers an interesting glimpse of the then-current thoughts about the film. A segment from the Independent Spirit Awards shows an 11-minute and 29-second chat mainly between Tarantino and smarmy filmmaker/TV personality Michael Moore. I can’t stand Moore, but this segment provides a nicely amusing and informal discussion of Pulp as the awards ceremony progresses. Samuel L. Jackson also stops by after he wins a prize, a piece that seems especially amusing since Jackson calls Moore “Roger”. The last few minutes feature an interview between Moore and producer Lawrence Bender, who remains a dull subject. After this we get a complete episode of The Charlie Rose Show that ran in 1994. The 55-minute and 27-second program includes an interview between Rose and Tarantino. Although it accompanied the release of Pulp, it provides very little info about that film. Instead, we hear more about Tarantino’s path to the director’s chair, his career, his influences and thoughts about other directors, his filmmaking philosophies, and a number of other topics. Some may feel frustrated that the show so rarely focuses on Tarantino’s flicks, but I think it gives us a fairly compelling and insightful discussion. 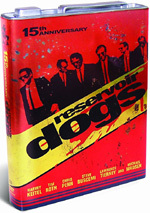 Under Also from Lionsgate, we find some ads for Jackie Brown and Reservoir Dogs. I've seen Pulp Fiction about ten times now, and it has yet to lose any of its luster or appeal; the movie seems destined to stand as one of the best films of the Nineties, and probably of all-time. The Blu-ray delivers erratic but usually positive picture and audio along with a strong roster of supplements. I wish the transfer was a little stronger, but this is still a good release that provides the best home video Pulp Fiction to date.